Explore the wonders of Australia … receive travel tips, itineraries and visitor offers sent straight to your inbox. 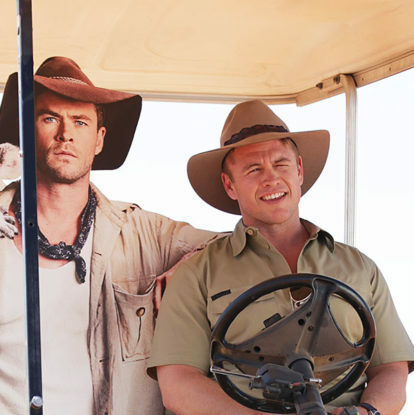 Actors Chris and Luke Hemsworth are intent on outdoing each other to show visitors the best of Australia, with Chris helming the now famous Dundee: The Son of a Legend Returns Home ad and Luke following up with his own tour of the Dundee set. One of the world’s great train journeys, the Ghan (pronounced ga-an as in the eponymous Afghan cameleers who brought camels to Australia to open up the outback) trip from Darwin to Adelaide covers 1851 miles of awe-inspiring Australian landscape, with excursions to Katherine Gorge, Coober Pedy, and Alice Springs along the way. This South Australian region is blessed with stunning coastal scenery, delicious local food (you should definitely try the oysters) and some serious wildlife encounters, no wonder it is called Australia’s Seafood Frontier. Oh, and it has a serious adventurous side, from shark cage diving from Port Lincoln to swimming with dolphins and seals . If you want to really get a handle on the Sydney food scene then a meal at Quay is a must; the multiple award-winning restaurant has just had a major make-over and the food, under the watchful eye of chef Peter Gilmore, is still exquisite. Book well in advance as wait times for a table can take months. Also known as Katherine Gorge, Nitmiluk National Park boasts 13 breathtaking gorges, as well as swimming holes, waterfalls, walking trails, Indigenous rock art and endless outback beauty. A luxury safari lodge, Bamurru Plains has exclusive access to 115 square miles of wildlife-packed floodplains and savannah woodlands on the edge of Kakadu National Park. Experience four nights’ accommodation including a return helicopter tour to the reef, dinner at qualia and more. Your 3-day and 2-night Luxury and Indulgence stay is overflowing with experiences that will leave you with a lifetime of memories. Includes Tali Wiru fine dining under the stars, a helicopter flight of Uluru, Uluru Sunrise tour and more. Exclusive wine and wildlife in South Australia: 8-day Adelaide and Kangaroo Island escape from USD$4,368pp*. Explore Darwin: discover Australia north to south on The Ghan Expedition from USD$1,867pp*.